Mid-West Truck provides a wide variety of slickline services to the oil and gas industry. We have extensive knowledge to meet our customer’s goals with some of the most cost efficient methods. Our experienced operators are dedicated to on-site safety and successful wireline services for your organization. All personnel are HSE certified, and exhibit honesty and integrity at all times. We strive to exceed our customer’s expectations. 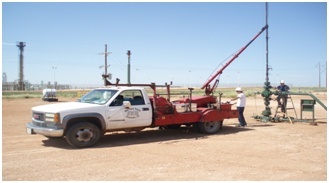 We will work with your team to keep production up and wells properly maintained, call today.